Price £9.95 from Fantasy Printshop. Late last year, Euro Decals started doing a set of Swedish Air Force decals, concentrating on the large numbers, diamond markings and serials that were found on the Draken. Now we are getting a series of other markings for the rest of the aircraft from around the late 1960s onward. This particular set consists of the fluorescent squares that one frequently found on a variety of aircraft that include the Draken, Pembroke, and Lansen to name a few. These were either in yellow or red fluorescent colors. Many Drakens also got a yellow fluorescent 'stingray' on the fin and those have been included in this set as well. 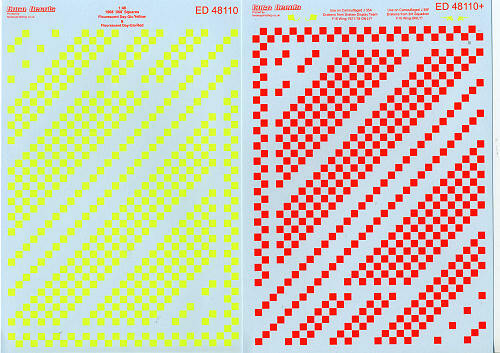 There should be enough of these exercise markings for several aircraft. The sheet is superbly printed and the scan doesn't convey the brilliance of the fluorescent colors very well. The instructions include a number of placement examples as well as other information. Thanks to Fantasy Printshop for the review sheet. You can find this and other products by visiting their website.